“Transforming Minds and Hearts: The Reading Room at Villanova” is a small, but very interesting and informative exhibit currently residing in the lobby of Old Falvey. Curated by the Rev. Dennis Gallagher, OSA, PhD, University Archivist, and Michael Foight, Special Collections and Digital Library Coordinator, the exhibit features materials from the University Archives. Joanne Quinn designed the graphics. In one case the spade used in the groundbreaking for Old Falvey and the trowel used in the laying of the cornerstone are displayed along with a newspaper article about the opening of the new Villanova College Library (Villanova was not yet a university). Also included is a photograph of the Library and one of Library’s dedication; the Rev. Daniel P. Falvey, OSA, librarian; the Rev. Edward J. McCarthy, OSA; and the Very Rev. Mortimer A. Sullivan, OSA, Augustinian Provincial, are pictured. 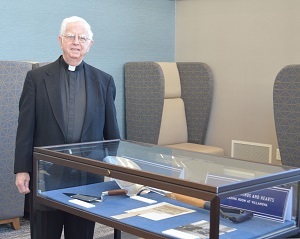 Falvey Memorial Library is named for Father Falvey who served as librarian for many years. The second case displays five photographs relating to Old Falvey. There is one of the large painting, “The Triumph of David” by Pietro da Cortona, being hung in the Reading Room circa 1950. The painting, after undergoing a two-year long conservation, was recently rehung in what is now the newly renovated Dugan Polk Family Reading Room. Other photographs in this case are a 1960s photograph of the Villanova College Library Reference/Reading Room, the same room in 1964 (all male students and be sure to note how they dressed), a 1962 view of the circulation desk in what is now the newly refurbished Old Falvey lobby and a 1969 photograph of the Library Science Library (in what is now the Dugan Polk Family Reading Room). The spaces and painting shown in these photographs are readily recognizable, but the changes rendered by the rooms’ renovations and the painting’s conservation are noteworthy! This exhibit provides just a small look at the treasures housed in the University Archives; there is far more, and some fascinating objects are on exhibit in the Archives. Father Gallagher and the University Archives are located in room 16B on the ground floor of Falvey Memorial Library. The Archives are open 9-5, although Father Gallagher prefers research appointments. Father Gallagher may be contacted at 610-519-4133.